“The threat of terrorism is very real,” Australian Prime Minister Malcolm Turnbull said. 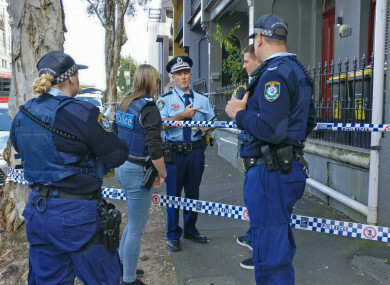 AUSTRALIA HAS FOILED an Islamist-inspired “terrorist plot” to bring down an airplane with an improvised explosive, authorities said today, after four people were arrested in raids across Sydney. Prime Minister Malcolm Turnbull said the plot appeared to be “elaborate” rather than planned by a lone wolf, as security was beefed up at major domestic and international airports across the nation. “I can report last night that there has been a major joint counter-terrorism operation to disrupt a terrorist plot to bring down an airplane,” Turnbull told reporters. The threat of terrorism is very real. The disruption operation, the efforts overnight have been very effective but there’s more work to do. Officials did not specify if the alleged plot involved a domestic or international flight, but Sydney’s Daily Telegraph reported that a local route had been the objective. Australian Federal Police Commissioner Andrew Colvin described the plot as “Islamic-inspired”, saying four men had been arrested in a series of raids across Sydney yesterday. “We do believe it is Islamic-inspired terrorism. Exactly what is behind this is something we need to investigate fully,” he said. Colvin added that local authorities had received “credible information from partner agencies” about the claims but would not elaborate further or state if the men were on any watch list. “In recent days, law enforcement has become aware of information that suggested some people in Sydney were planning to commit a terrorist attack using an IED (improvised explosive device),” he told reporters. He added that several items “of great interest to police” had been seized in the raids but police did not yet have a great deal of information on the specific attack, the location, date or time. He said the investigation was expected to be “very long and protracted”. However, we’re investigating information indicating the aviation industry was potentially a target of that attack. The men, whose ages have not been released and have not yet been charged by police, were arrested yesterday when armed police stormed homes in at least four neighbourhoods, including in the inner city. The Seven Network reported 40 riot squad officers moved on one inner city home before an explosives team found a suspicious device, although police would not confirm this. National broadcaster ABC quoted a woman as saying her son and husband were arrested in the raids, but denied they had links to terrorism. Turnbull said the national terror alert level, which was raised on September 2014 amid rising concerns over attacks by individuals inspired by organisations such as Islamic State, would remain at probable. Canberra has introduced new national security laws since then, while counter-terrorism police have also made a string of arrests. A total of 12 attacks, before the latest announcement, have been prevented in the past few years, while 70 people have been charged, Justice Minister Michael Keenan said. “The primary threat to Australia still remains lone actors, but there’s still the ability for people to have sophisticated plots and sophisticated attacks still remain a real threat,” he told reporters today. The prime minister added that the alleged plan appeared to be “more in that category of an elaborate plot”. Several terror attacks have taken place in Australia in recent years, including a Sydney cafe siege in 2014 where two hostages were killed and the murder of a Sydney police employee in 2015 by a 15-year-old boy. Email “Australian PM says an 'elaborate terror plot' to bring down an airplane has been foiled”. Feedback on “Australian PM says an 'elaborate terror plot' to bring down an airplane has been foiled”.